I couldn't sleep last night. 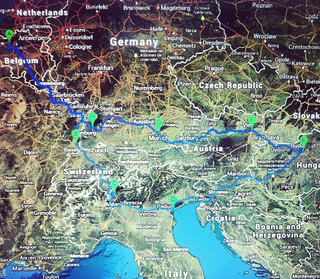 So I stayed up till now (7:30AM) planning a road trip I'll be taking through the heart of Europe. End destination? The Hungary F1 race baby! I'll be doing the round trip from Belgium in late July, and it'll put about 3,800 clicks on the car, a first gen RR Sport diesel. She's an old gal with over 160k on the odo, but she's getting a new compressor and an inspection in a few weeks time so she should be up for it. Fun planned stops are Mulhouse where the Schlumpf collection is housed. Lake Como which will hopefully be a relaxing 3 day stay. Munich to finally pay the BMW Welt museum a visit. Vienna, Venice, and the top bit of Croatia (beautiful Zadar) and the Black Forest are also planned overnight stays. I may actually rush Germany to get back to Belgium for the Spa 24 Hours race since I won't be able to catch the F1 race there later in August. Does OPPO have any tips on great stops along the way?